Concentration Camps Opening Across Greece. 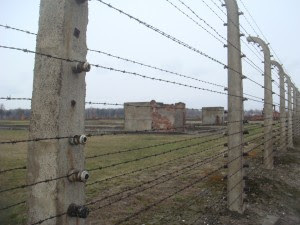 Birkenau fence from WW2. Soon tens of thousands will start disappearing behind barbed wire in new 'closed hospitality' centers across Greece. What starts in Greece will no doubt spread across the continent. Greek democracy is in paralysis with the main parties no longer able to win majorities. It's the same in many countries across the EU where loss of authority has lead to the fracturing of the main parties. That plus blame all your troubles on the influx of desperate foreigners - most of whom are dislodged by NATO's wars. The descent into barbarism is complete. This of course is entirely intentional. Last week an elderly pensioner called Dimitris Christoulas, who declared that he was reduced to scavenging dustbins to stay alive, publicly executed himself in the great national theater called Syntagma (Constitution) Square situated in the heart of Athens. His funeral was practically a state occasion. The affair ignited once again the flames of fury directed against the organized looting of the country. In no time at all the promise of a network of ‘closed-hospitality centers’ (lock-ups, all said and done) bolted to the forefront of the election campaign. This could only have happened with a grace and favor nod from Lukas Papademos. I pause here to remind readers that this same Papademos was the key official on watch at the Greek central bank when the country was hustled into the euro back in 2000. Wall Street banks were busy with the smoke and mirrors to make it appear that the glory that was supposed to be Greece in fact concealed hopeless insolvency. There is no doubting that Greece is in the forefront of the refugee wave emanating from the Middle East, Pakistan, India and Afghanistan. The number is unclear because the number of undocumented aliens in the country is largely a guesstimate. However the influx is probably in the region of 130,000 a year, which in such a small country having an ethnic population of just over ten million is bound to promote severe friction. What the Greek authorities refuse to recognize are the reasons why Athens, the capital, has become Chicago on the Aegean. Next comes the power of Greek crime lords responsible for promoting Athens as one of the major crack hubs in Europe, with weapons smuggling and trafficking in human flesh thrown in for good measure. Lately baby snatching has been added as a new specialty. How about this for sheer humbug, flying in the face of everything that is known about crime in Greece: “On the basis of arrests and investigations we believe that up to 70% of violent crime is perpetrated by foreigners and I say this without wishing to demonize migrants,” said police spokesman Thanassis Kouklakis. I should add that the Greek national gendarmerie and municipal police forces are routinely racialist. The quote simply confirms our knowledge on that score. The uncomfortable truth is that Pasok, which is essentially a vehicle for the long-ruling Papandreou dynasty, was largely responsible for promoting the power of the Greek mafia in the first place. Andreas Papandreou, the choleric tortoise-like Pasok godhead who ruled Greece as a virtual dictator throughout the 1980’s, let the black genie out of the bottle. It was he who pursued the ‘anything goes’ policy with the Greek mafia in return for their acting as the praetorian guard of his crooked administrations. There is strong evidence that he was using mafia sharpshooters masquerading as Marxist urban terrorists to settle scores with his enemies. Once they arrive in this prosperous junction of criminal networks, risking their lives in long overland treks and risky boats, the average new recruit may soon earn as much as ten thousand Euros a year from the rich harvest of pickings. All but the small change is siphoned off by pimps and gang leaders plus the ‘landlords’ who sub-let semi-derelict properties bunched together in the downtown slum area of the capital – within sight of the Parthenon. Stone-faced Greek officials maintain the pretense that unwanted guests arriving in droves are almost entirely responsible for the wave of crime sweeping the capital. This of course is nonsense, since they are absent the skills, resources or contacts. In fact as the daily Ethnos correctly reported, the powerful crime syndicates are all Greek, plus a lacing of Albanians, Syrians and Egyptians. The center of Athens is virtually a no-go zone for law enforcement, thanks to another uncomfortable truth. This is the notoriously lethargic tendencies of Greek policemen when it comes to salary enhancements proffered by the local crime barons. Further investments, offered in the same time-honored Greek fashion, make sure that awkward public officials steer well clear of the lucrative activities pursued under their noses. As any Greek will tell you corruption and bribery is endemic in the civil service. In the past few days the tragic story of Humayun Anwar (18) and Wakar Ahmed (33) provides an insight to the life of immigrants who pay human smugglers up to seven thousand Euros apiece to get to Greece. The pair fled the poverty and desperation of the Indian Punjab, only to find themselves trapped as virtual slave laborers, forced to work ten hour shifts, seven days a week, for 25 Euros a day. Both were horrifically killed as they struggled to save an elderly Greek couple whose car tumbled into the path of an approaching Athens-Thessaloniki express train. It is the fate of Greeks to have been ruled by ruthless self-serving demagogues in one shape or another since gaining independence from the Ottoman Empire in 1832. The latest episode of EU-imposed direct rule is just another example of lordly misgovernance forced down the throats of the Greek people. The immigration issue has now risen to the fore solely to drown out the destruction of the country typified by the martyrdom of Dimitris Christoulas. What we detect is the rank smell of hypocrisy in the run up to the general election at which time Greeks are supposed to vote in favor of flaying themselves alive.